tv-ooh: tv we like to watch on the tv: The Bridge II: Episodes 1 & 2 - More terrorists with a penchant for elaborate point-making theatre? 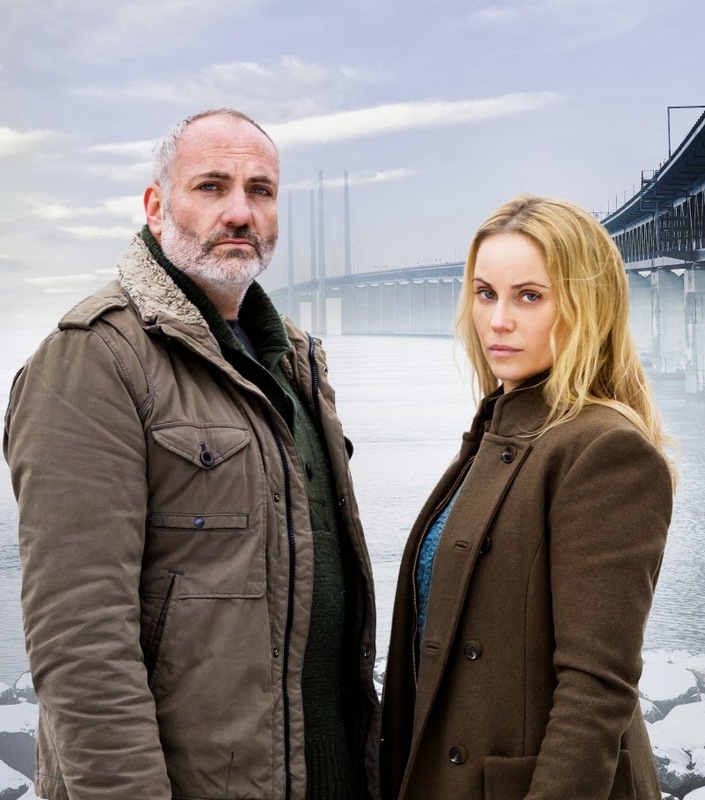 The second series of the gloomy Swedish/Danish police thriller The Bridge got off to a flying start didn't it - mainly because it was so inexplicably thrilling to see Saga and Martin back again. Saga's still in that same long coat, those tatty leather trousers, and wearing the same blank expression while speeding about in her Porsche; meanwhile, Martin's come off a bit worse: his jeans appear tighter, his jacket's cropped shorter, and his beard's a bit greyer. If you didn't know better you'd think he's turned into a bit of bear-type. Maybe it's the grief at losing his son August at the end of season one; maybe they've just got someone new in Wardrobe. But what's so good, and also feels a bit surprising, is that the after-effects of season one are properly picked up and continued, rather than just head-noddingly acknowledged in the first five minutes before the adventures begin again. You'll remember that, last time, the killer, otherwise known as Jens, had a penchant for elaborate point-making theatre, when all he wanted to do was get revenge on Martin for the affair Martin had with Jens' wife, which he believed led to her death. There were nine episodes before we got to that point last time. Now, 13 months on, Martin decides he wants to see his son's killer in prison, but no words are spoken between the two, which feels a little bit disappointing. The producers re-employed the Jens actor for that, you think to yourself. Instead, the killer just sort of grins, and you wonder if he's somehow involved in the crime under investigation this season and your heart sinks a bit. Surely not. We can't all go through this again, you think. As great as the first season was, by the time the conclusion came, it all started to feel like a bit of runabout, gripping as it was. However, these are hopefully false alarms: although the enthralling atmosphere is undoubtedly back, there's also relief at how the writers have managed to keep the actual 'The Bridge' at the centre of the mystery for a second time without repeating itself. This season, the bridge - that's the Øresund Bridge which connects Malmö in Sweden to Copenhagen in Denmark - is deliberately hit by an abandoned ship (a ship, not a boat, remember) with several young people imprisoned on board, all of whom are dying of a plague. They're the apparent victims of a group of four young terrorists who like to wear animal heads and post messages on YouTube about animal rights abuses, while spreading this deadly plague and poisoning fruit and fish and having intense discussions about their plans, which take place in some dank warehouse or other that's only illuminated by lamp-light. They are all, of course, damaged in one way, which will unfold in one way or another over the coming weeks, and give us a subplot or two: notable so far is Mads, a good looking psychopath and possibly the ring leader, with an eye for blowing up cars, while another, Niklas, is solely responsible for a wayward younger brother who decides to set fire to his legs to try and impress the school bullies, and therefore leaving Niklas wanting to opt out of the group, but Mads won't let him. But either way, it seems that, by the end of episode two, this year's enemies are so-called Eco-warriors with murderous intent with, um, a penchant for elaborate point-making theatre. Let's hope the Truth Terrorist isn't their Mister Big, but you could, at a push, almost forgive them the return of the Truth Terrorist, so good is it to see Saga and Martin back. Did I mention that? The Bridge I: Episode 5 & 6 - Who IS the killer - Ake, Stefan or... Martin (or someone else)?